There is a lot of work going on around here and it's not just me. We are having a new roof put on our house this week so I pray I make it through this post without having to vacate the premisses due the hammering above me. It's gonna be a long week. 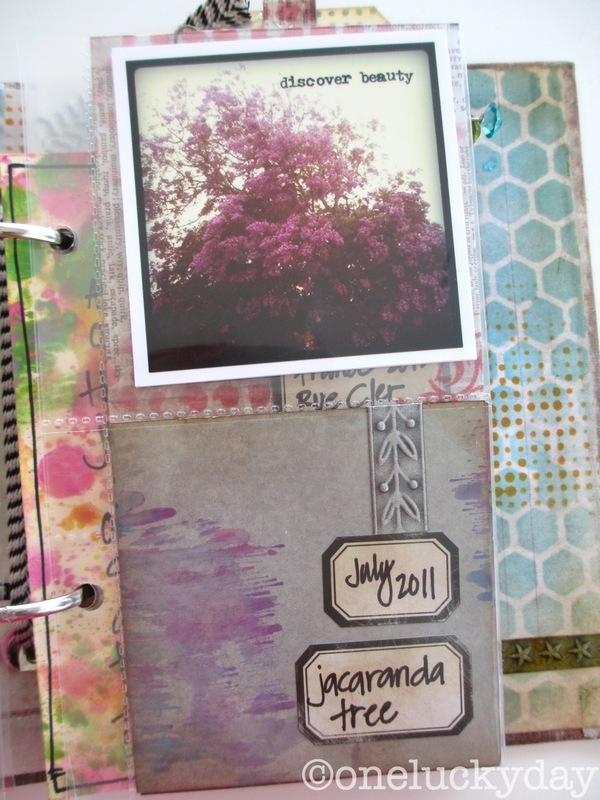 Today, I'm sharing the Worn Cover journal I made for CHA. This is only one of the 3 new covers that were released at CHA last month. The size is just a bit wider than the last one we did.... to accommodate the new Page Pockets of course! I colored the Ornate plate with Alcohol Ink and added a Remnant Rub title. Perfect for this little book. Instead of using brads to hold the Ring Binder in place, I used foam tape under the Ring Binder (on the inside) and some of the new trimmings. I added a Type Charm with my initial and a wishbone. You can't see it in the picture but they are dangling from a long chain that is hooked into the bow. One thing I wanted to point out before I move on to the inside, is that the Worn Covers are covered in fabric. Which means they can be colored with Distress Stain. The cover on the right side is right out of the package. The cover on the left has been colored with Gathered Twigs Distress Stain. All I did was saturate the edges of the cover, lightly spray it with a mini mister, then just work it toward the middle with a wet wipe and a paper towel. It's almost like you scrub your way across the book. I will warn you, it will look really dark when you are putting on the stain but once dry, the color lightens significantly (it dries rather quickly too). So don't be afraid to use dark colors like Walnut Ink or Peacock Feathers. This is one I did with Dried Marigold and Broken China. I like the mix. Okay, now on to the inside of the book. It's really is all about the new Layering Stencils inside. The cover and all the pages were created with Distress Ink and a Blending tool. Super easy, no mess, and easy clean up. The stencils are heavy duty and clean up well with a wet wipe. I put all my stencils on a ring (they have a hole at the top) and left them there. I completed the entire book, never once removing them from the ring. I just spun out the stencil I wanted, wiped it off when I was done, and it went right back into the mix. If I was using paint or a spray it might not have been as easy to do it this way...but Distress Ink was a no fuss, no mess solution. The Page Pockets come in two different packages. 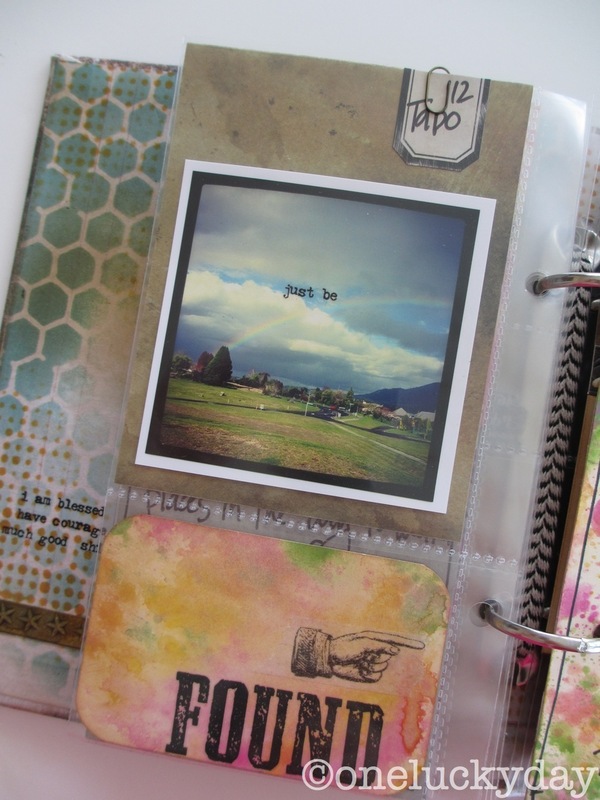 One has a space for a #8 tag, the other has a variety of small pockets (6 pages, 3 styles). For those of you that follow Tim's 12 Tag series (and create a new tag each month) the #8 package is perfect for keeping a years worth of tags in one little book. genius. All paper is from the 8 x 8" Collage paper stash. I had a variety of 3 x 3" Instagrams printed for the book. Just pictures I liked, not really a theme. The tag here is slipped into one of the clear pockets. 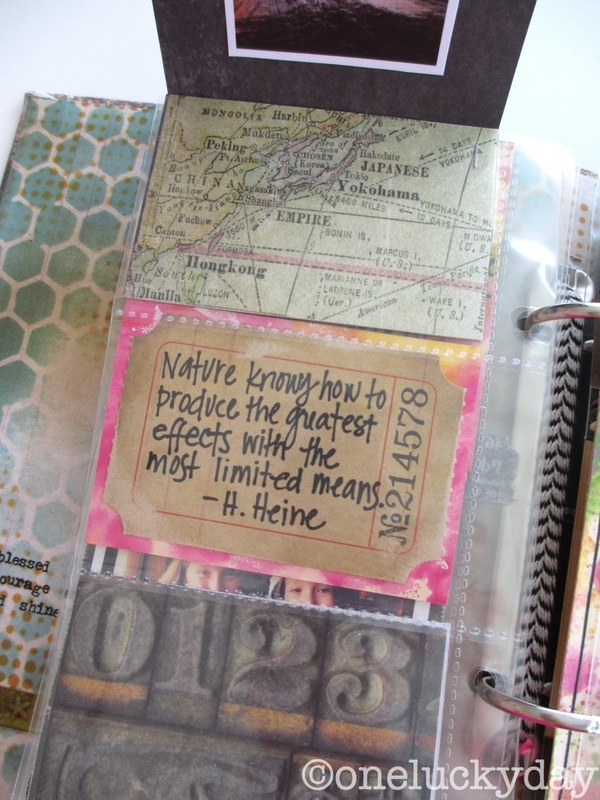 You have the choice of covering up the journaling or leaving it front and center. This page has three separate compartments of the same size. Love those Industrious Arrows and numbers! The paint technique shown here was done by adding paint in rows on a craft sheet, then lightly running a blending tool over the top, then onto the paper. Have you ever though about putting a Remnant Rub right in the middle of your picture? It worked great here. Industrious - Borders painted with Distress Paint. Here the #5 tag is hidden from sight behind the paper. I used a Tiny Attacher to staple the paper directly to the pocket so the paper would stay in place when the tag was pulled out. Star Tissue Tape comes from the new Merriment Tissue Tape pack (1 of 4 designs). 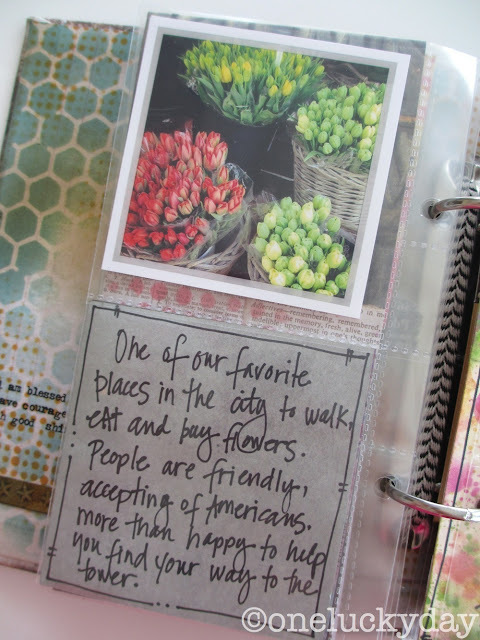 Another product that was released at CHA was a Binder Punch that will punch holes to match the Page Pockets. I used it here to add a quote between the Page Pockets. There's one of those Mirrored stars...love, love, love. But then it flips open to reveal and story inside. The two pages are held together with 1/4" Wonder Tape. The back edge is taped down with Tissue Tape. Only a couple more weeks for the Worn Covers, Page Pockets, and other Idea-ology goodness to arrive in stores. Stencils on the other hand started shipping this week. Yeah! they are really good Sue. I know you will like them. 1. I love the colors you alcohol-ed the ornate plate in!! 2. I love that you used the definition of Remnants for your page!! 3.The layered stencils look awesome over ALL the papers! Can't wait!! 4.Love the DISCOVERY star! very cool looking! thanks so much Dolly...I love that nothing had to match exactly...just colors and pictures I liked. This is amazing!!! I love the layering...the mix-n-match, the colors!!! The great embellies!!! I LOVE this mini!!!!! 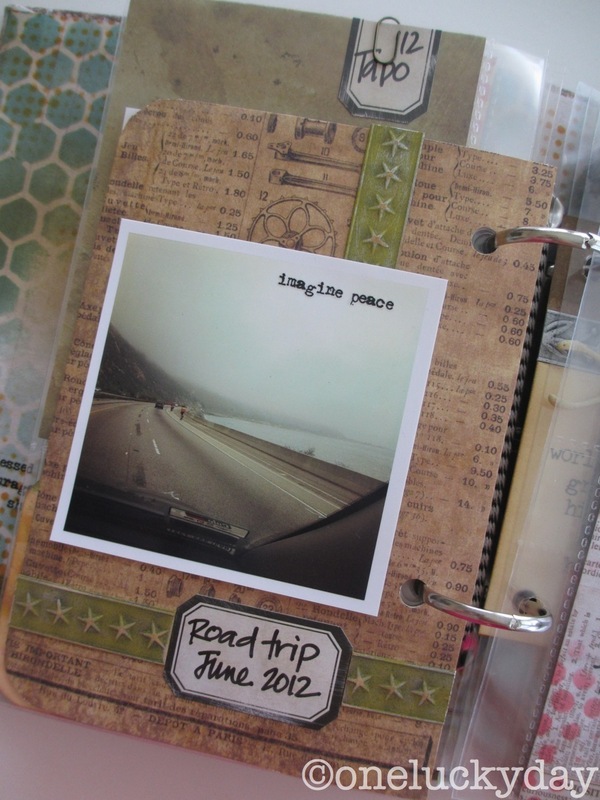 What a fun remnants journal in which you've shared bits from here and there of your life's journey. What a great idea and so colorful and full of intrigue and mystery as one awaits to see what the next page has in store for the viewer. Thank you! Beautiful journal and beautiful pages. 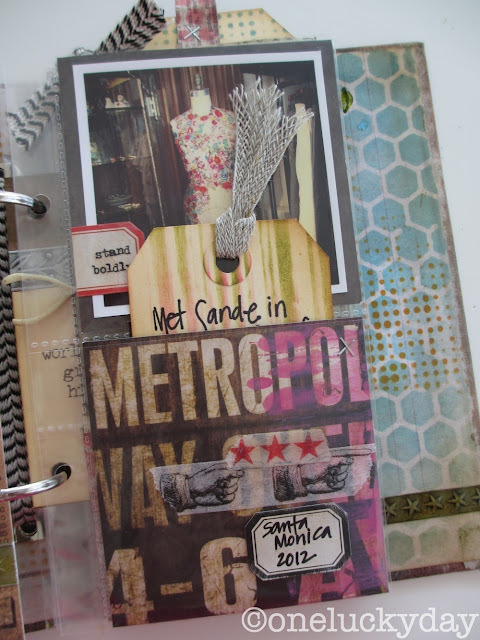 Love the layering stencils. Maybe they will be selling the layering stencils at the event...you never know! Have a great time you will love it I know! I love this madly. MADLY!! What can I say - fabulous (make sure you read that with the right kind of attitude behind it!). The coloring on the journal cover is awesome - really makes it look like an old, worn book. The inside pages have all kinds of hidden goodies to pull your eyes in! It's truly FABULOUS! Kat you are too nice. Thank you so much for your nice words! Oh Paula! Your creative posts hit me right straight into my wallet! And you hit it big time today. I love, love, love this book and can't wait to get a hold of Tim's products! Thanks again for the inspiration. Heidi,if you bought the layering stencils you won't be sorry. I can't get enough. So excited about the worn covers and page pockets. Yours is absolutely fabulous! Only a few more weeks and I can make my own! Yippee! 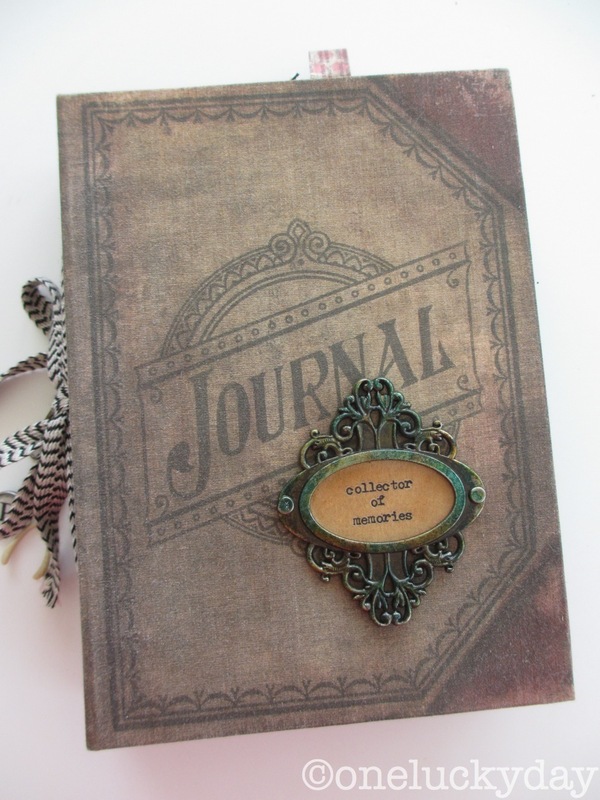 Awesome journal! Love every inch of it. absolutely delightful! So much eye candy and texture! You did an amazing job! Thanks for the inspiration! too funny! I use them on photos all the time. The type is so small that it is perfect. Wow that's one incredible journal album! And yes, I love love love the new stencils!! Got to have them!! This is an absolutely beautiful journal. 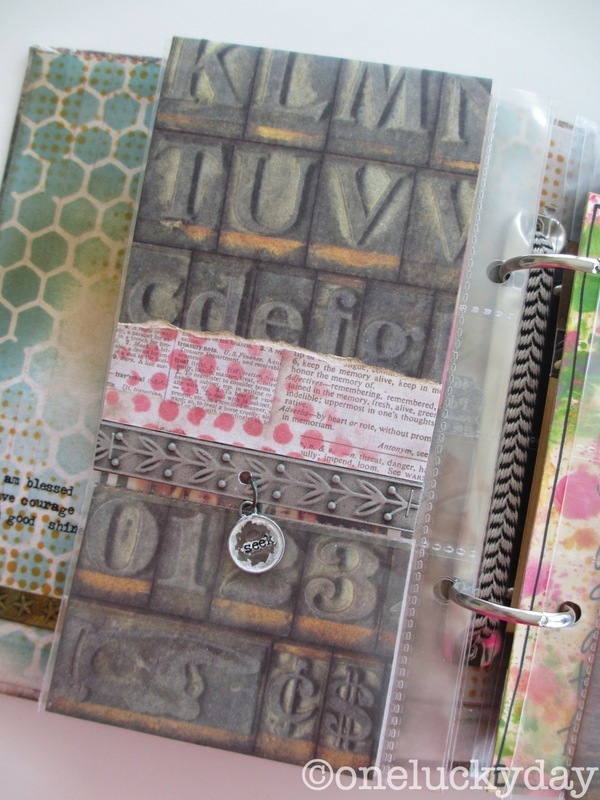 I am so inspired to make one and I so look forward to using those fabulous stencils! Your book is fabulous. Can't wait for new products to begin arriving. I truly appreciate all the details and info you include with the many pictures you provide. Your work is amazing and inspiring. I am still trying to pick my jaw up off the ground. . . This is stunning! I don't even know where to start because I loved it all! You used all of the products so well, and of course have made me want everything that was released at CHA. Thanks for sharing your talent with us. thanks Maureen, so very nice of you! Fantastic!!! What a wonderful journal ~ can't wait until the stencils are available so I can play too. 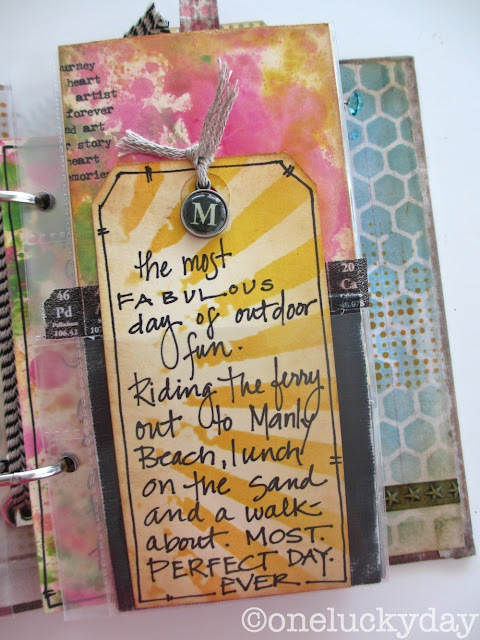 I know you are showing stenciling with this uber fabulous project, but I can't take my eyes off your handwriting!!!! You have gorgeous penmanship!!!! You need your own font!!! anita, you make me laugh! My penmanship is either feast or famine. It takes the right pen too. But thank you just the same. thanks miss yaya! and you are right, you need the layering stencils. I can only imagine what you could do with them! Paula, what a Fabulous journal!!!! There is so much beautiful detail. I love everything! Thank you for sharing. A feast for the eyes and the creative part of the brain! I just love that tiny banner hanging down from the paperclip - what a genius detail. I WILL be getting your journals! Thanks! Wow, that is truly spectacular & completely gorgeous. What a fabulous project,I so need those stencils. Thanks for sharing. yes, that is my normal writing...a good pen that you are comfortable with is the key. The font for the quote is called John Doe. It is not a free font but it's a good one. Wow, Paula, this is an amazing project!! And I agree - your handwriting is great! I couldn't believe how many pages and techniques you have in this one project. Thanks for sharing!! Oh my goodness!! This is a wonderful work of art!!! Love it!!! Hi Paula, this is a delightful project and it was so much fun to see how you did the different pages! 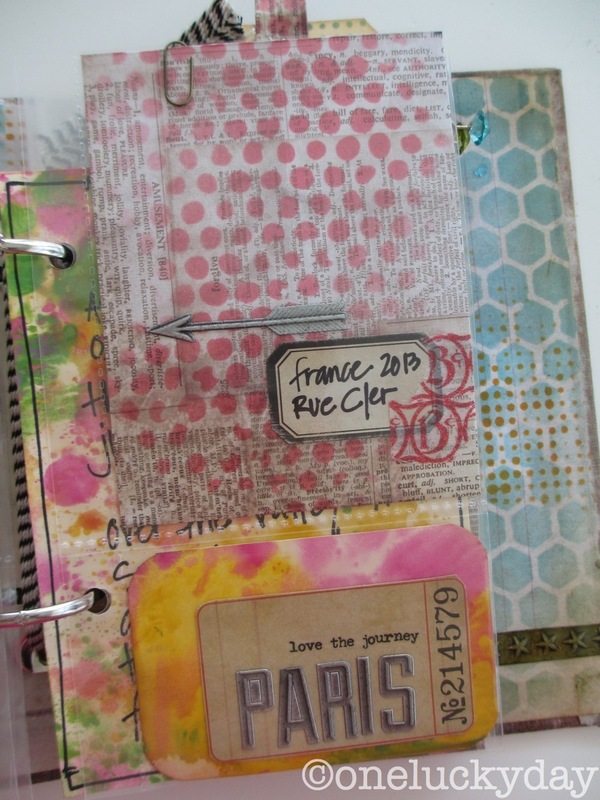 I just love those stencils and your color choices - wonderful! Already got my stencils ordered...can't wait to receive them!! Thanks again for all your amazing inspirational projects!! Sheila, I have them printed at Foxgram http://www.foxgram.com/ I think they were .25 each and .99cents shipping. What an amazing project!! Beautiful work!! I'm in love - what a fabulous project! This is so lovely. I can't stop looking at it. This book is really amazing. Wish I could turn the pages in person! Page Pockets?? How did I miss these?! How cool. I love every single page you created. You are truly a genius when it comes to putting all of these elements together. 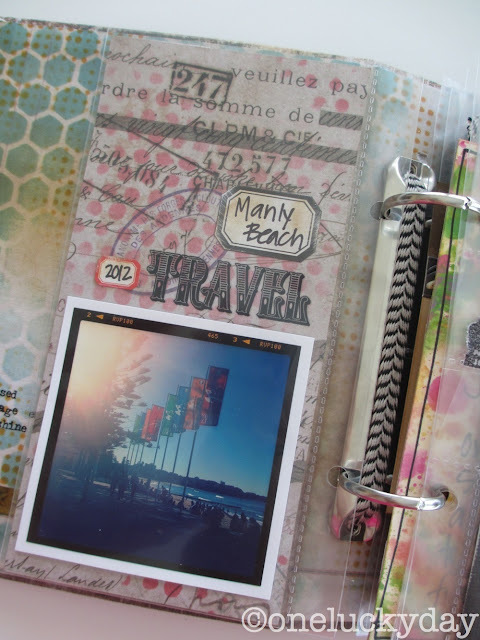 I just made a travel journal that totally pales in comparison! Oooh! Aaahhh! Ooooh! Aaahh! Lucky woman!My favorite page was the honeycomb with the moths stamped on top. I can't wait to play with these stencils. 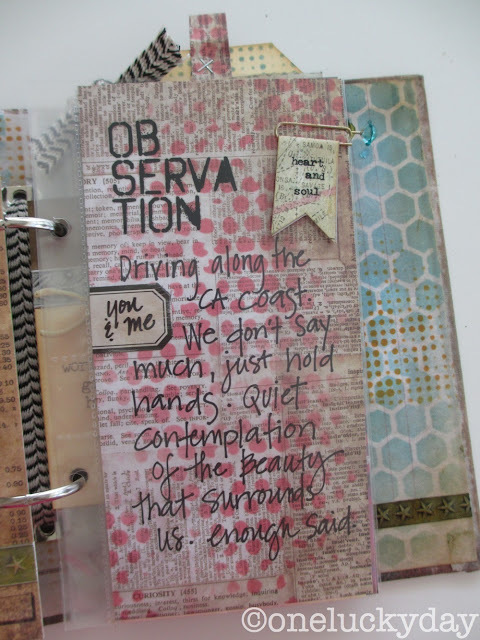 Oh Paula, I love your Journal it's so "fun" love all the elements, and how you used the stencils. I'm so in love with those layer stencils can't wait to get some... thanks to Tim and Ranger I'll have no money the rest of this year LOL !! My Wish/Want list is so loooooooooooong ! 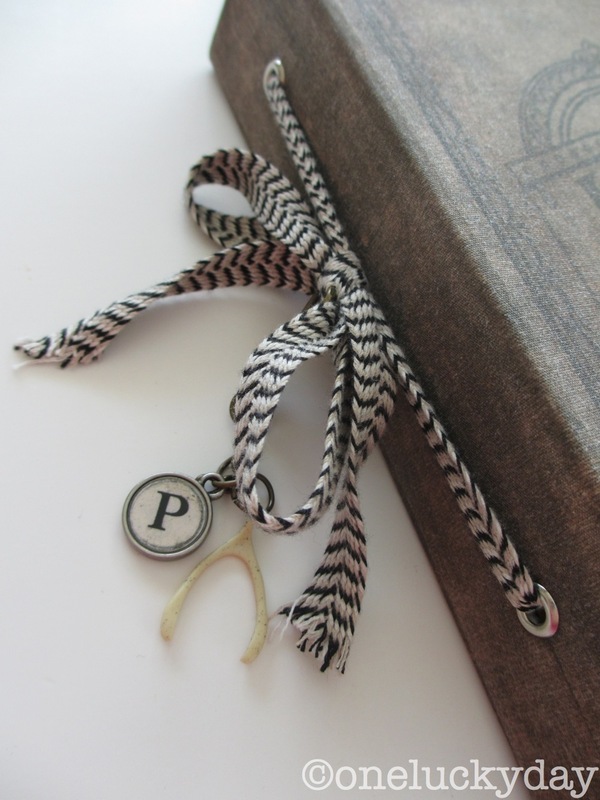 The Journal is wonderful...so special to visit pieces of 'you'. Paula! 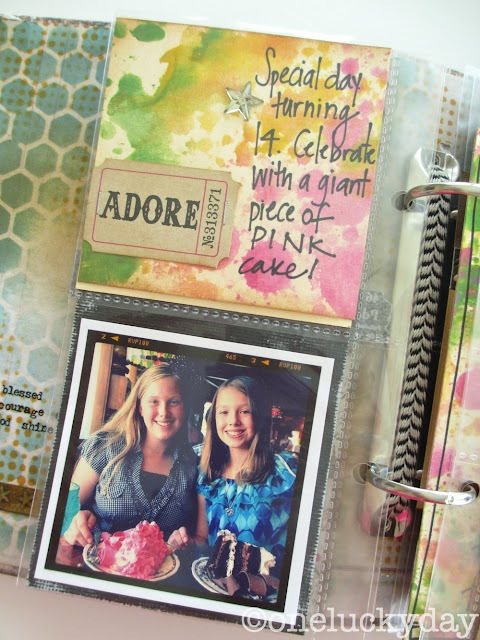 This journal is over-the-top wonderful! What a gift you have!!! And thank you for sharing your inspiration with all of us!!! 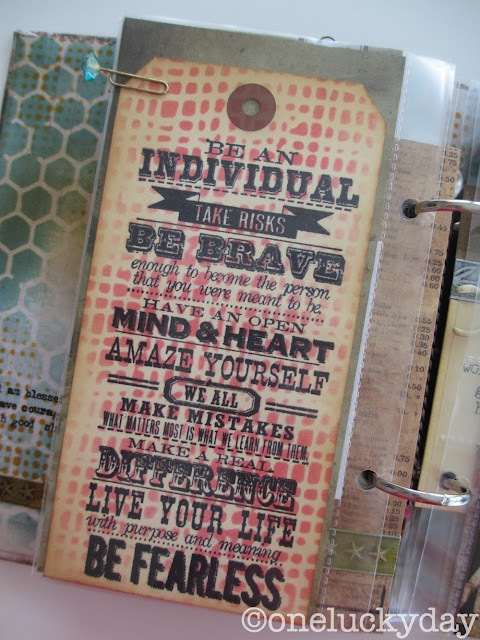 Want all the stencils and I just love your journal (and your writing!). Really love the page pockets too, those look neat! Hi Paula, I haven't been able to visit for awhile but today I am happy to see your journal. I love it and it is just what I need. I am not up with the new products but I will do some catch up. Missed you. Wow. What an amazing project, Paula. Came over from Simon Says Stamp.